We live in an age where quality of life is high on our agenda. Modern advances in communications, medicine, technology and leisure should allow us better health, longer life and more relaxation, yet how often do we hear "I'm tired, I have no energy, I'm stressed out?" The impact of psychological stress as well as physical stress, include electromagnetic radiation from mobiles, computers etc can have a variety of effects including lack of energy and focus, headaches, poor sleep, skin complaints, mood swings, frequent colds and infections. More severe conditions can arise if your stress is not dealt with. 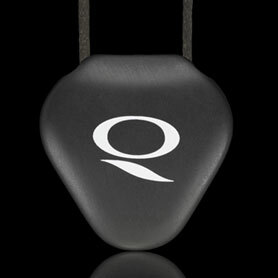 The Q-Link pendant provides continual support via its proprietary technology SRTTM (Sympathetic Resonance Technology) which integrates the biological and energetic functions of the body identified in both Western and Eastern Sciences. It works along the same principles as acupuncture - but without the needles! Whenever you are under stress in your day to day life (workload, mobile phone, sports performance, computers, emotional pressure, etc) the first process that gets compromised is the energetic system. This is the signalling process of the body that is fundamental to all the physical processes. If the stress continues then one of the physical systems will show symptoms of that stress. 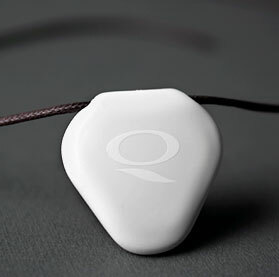 By continually helping the body to re-balance itself the Q-Link helps the wearer to perform at their best more often and, simply put, to run their body in a more efficient way. Each pendant contains a resonating cell, similar to a microchip, which programmed with the healthy frequencies of the body that, when worn over the heart area, strengthens and balances your body's energetic system. The resonating cell is activated by the copper induction coil which picks up sufficient micro currents from your heart to power the pendant. The Q-Link, containing the stronger frequencies, works like a master tuning fork, constantly reminding the body of its healthy frequencies and thereby helping it to self correct on a continual basis. "The body has 100 trillion cells, each performing millions of tasks each second. For the body to be healthy and fit, these cells have to function as a resonant, harmonious whole. The magnificence of this complex orchestration is staggering, and is synchronised by the body's intelligence, energy and matter fields. The Q-Link appears to act as an interface between these fields, effectively as the conductor of the orchestra. The data is sufficient and strong enough for me to wear Q-Link and I must say I feel invigorated wearing it." Deepak Chopra, M.D. Wearer of the new generation Q-Links have noticed the beneficial effects quicker, experience faster recovery times under stress and have realised improved overall energy and stamina levels. They have also detected higher levels of concentration and greater ability to focus. Classic design with a more retro feel, popular with sports enthusiasts. Lightwieght bio-compatible acrylic body houses the SRT2 technology. Suitable for both men and women. If you are interested in finding out more about Q-Link or purchasing at the special discounted rate, then get in contact with us by either email or phone on 07813 184180. Prices shown do not include P&P.